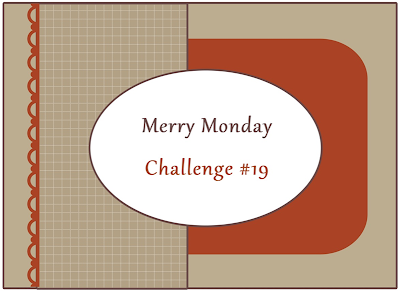 My friend Lesley Croghan asked if I would be her guest at the Merry Monday Challenge for May, and I was so happy to accept! Thank you, Lesley! You know those $1 Scrap Bags I've gotten from my Stampin' Up! demo? Every paper I used here is from there! I don't know the names of these retired patterns, but you probably recognize them. I tried to capture the shimmer on these snowflakes. I used Winter Frost paint from Creative Inspirations (there's a link at the end of this post) and they look sooooo pretty in real life! congrats, colleen! love your curved corners on the adorable card! What a great Christmas card Colleen! 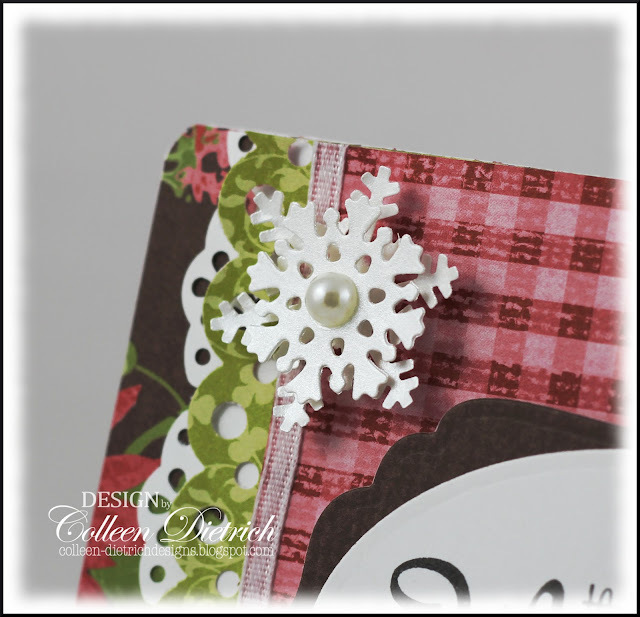 Love the snowflake and the dies you used! And a fun sketch. Congrats on being the guest designer!!!! Congrats on your GD position! What a lovely non-traditional Christmas card! Love your approach to the sketch Colleen! Beautiful as always! 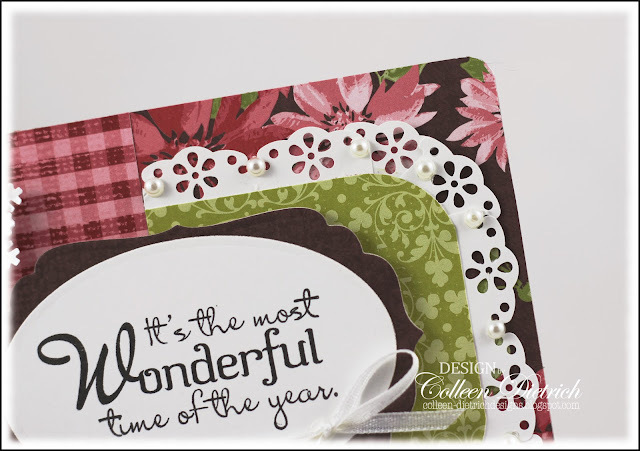 Love the pattern mixture - fabulous card! Such a gorgeous card Colleen! That white lace trim around the main panel is beautiful! Thank you for joining me this month! Congrats Colleen on your guest designer spot! You rocked this sketch with this pretty card. Great mix of papers and I love the way your lace echos your frilly snowflake. Wonderful Christmas card, Colleen! Great papers from that SU bag..how nice to have that. Love your sentiment stamp. Beautiful card, I love how you did the lace trim. Oh, what a beautiful card! Cheerful, festive, and feminine! Oh wow! Gorgeous! Love the layers and patterns! 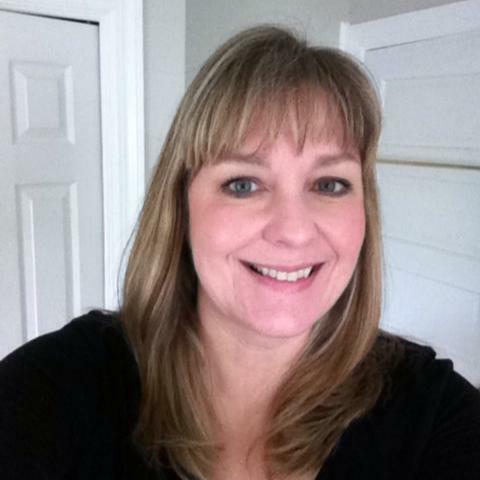 Congrats on your feature Colleen! So well deserved! What a beautiful Christmas card! 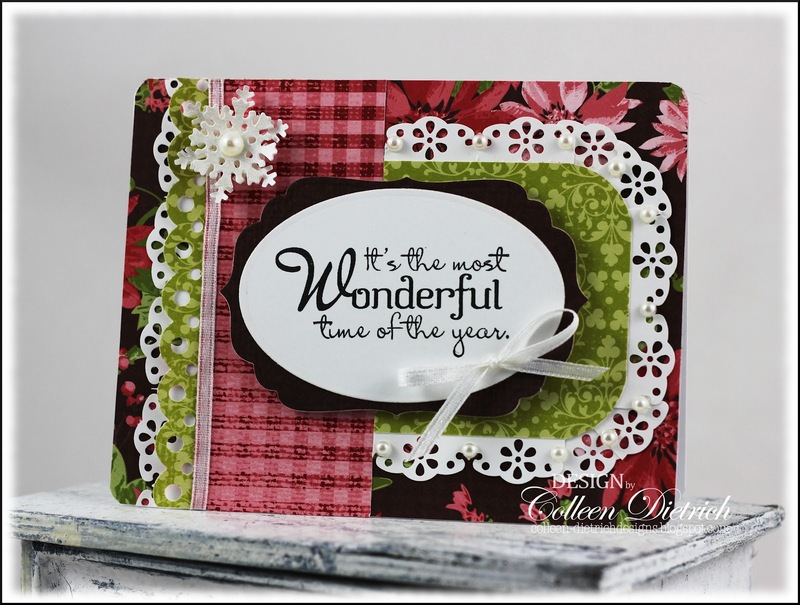 Love the pretty border and wonderful sentiment! Before we know it, Christmas will be here! What a stunning creation with those pretty papers, pearls, and lacy borders! Gorgeous!! Your card is absolutely WONDERFUL - so many pretty details and perfect design! Love it! Congrats! Those papers make a gorgeous Christmas card! I love it!!!! If anyone deserves it too be featured it certainly is you. Colleen you developed an unique style that I just love and this card a fab example of talents. I lvoe the mix opf colors and patterns. Beautiful papers and edging, Colleen! I love the label sentiment and that snowflake decked in a pearl! 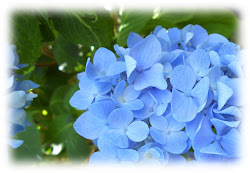 I was so excited to see that you are going to be our May Guest. Congratulations, Colleen! Your card is beautiful! LOVE those lacy edges! 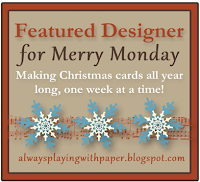 A huge CONGRATS on guest designing at Merry Monday, Colleen! This card is so incredibly beautiful. I love that you used so many scraps for it!! Beautiful details, lovely layers. Sigh. What's not to love about this sweet Christmas card?? Fabulous work!